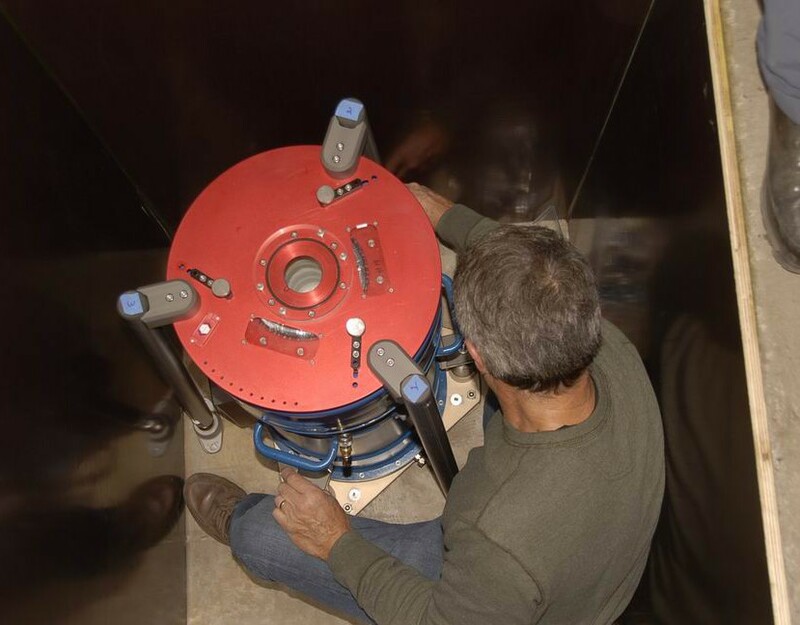 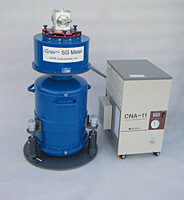 Because of mechanical wear, absolute gravimeters are not well-suited for continuous measurements lasting longer than a few days. 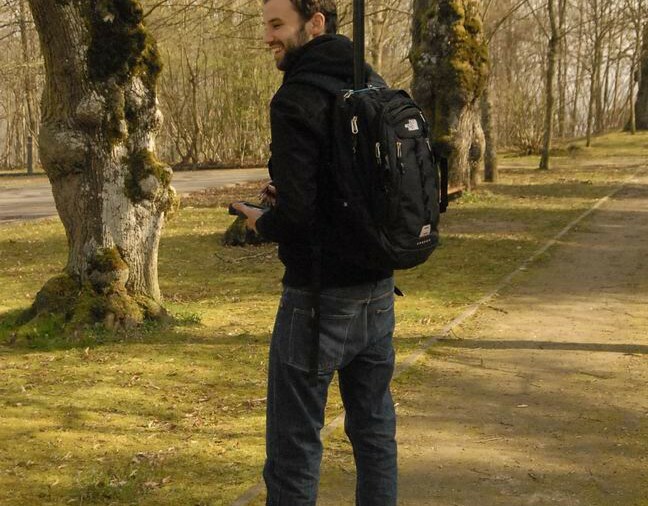 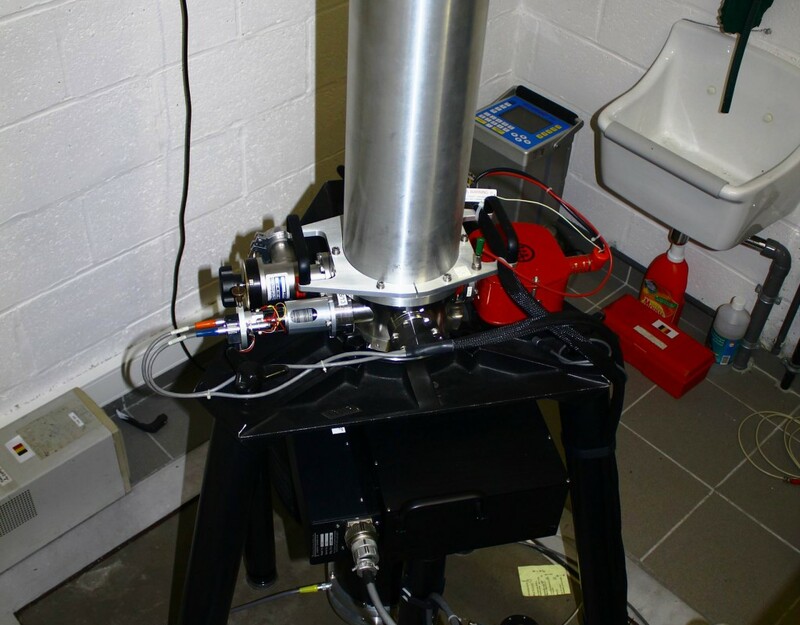 In Rochefort, as the instrument ran for several weeks, which is not common, only one gravity data was measured every 270 minutes in stead of 60. 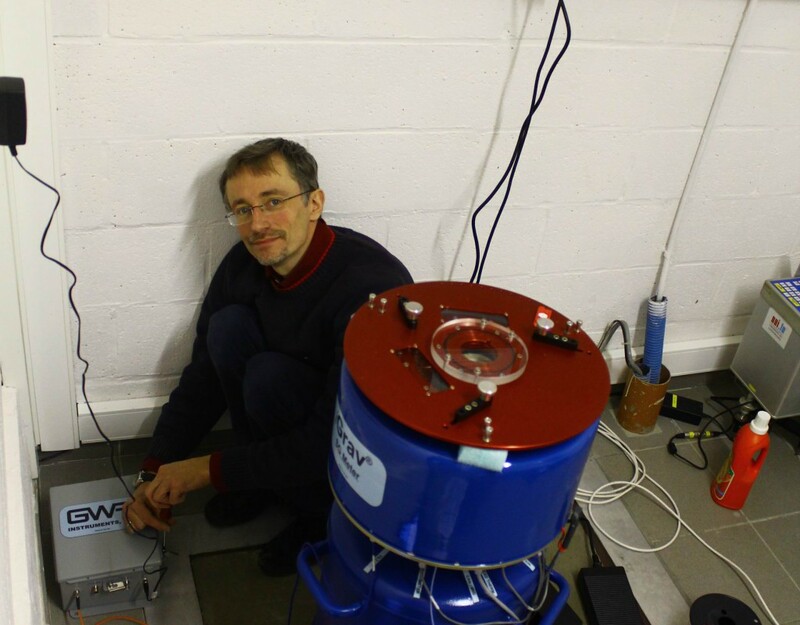 This limited the resolution, in both amplitude and time domains. 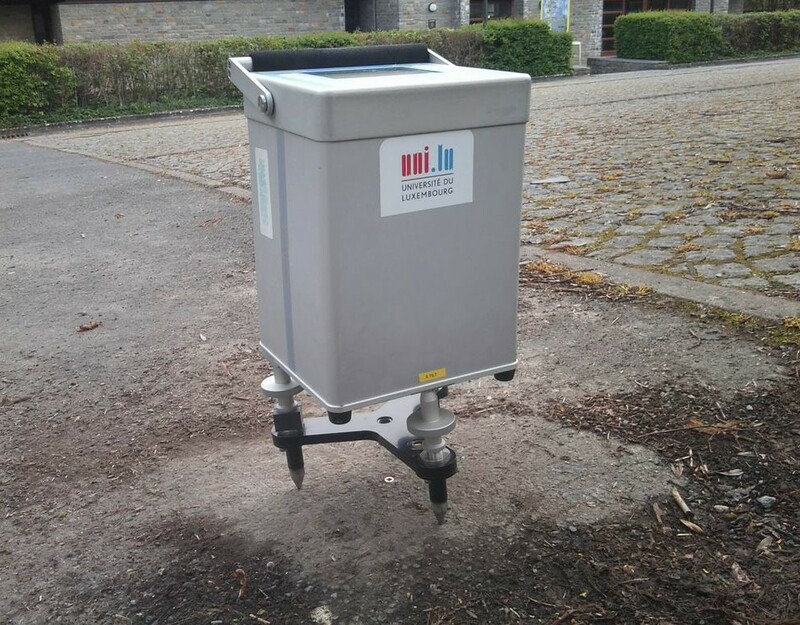 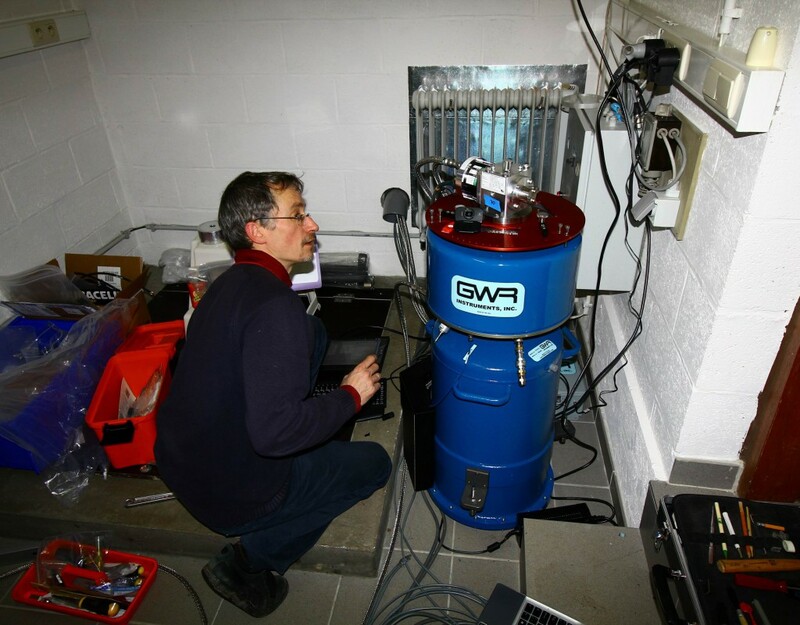 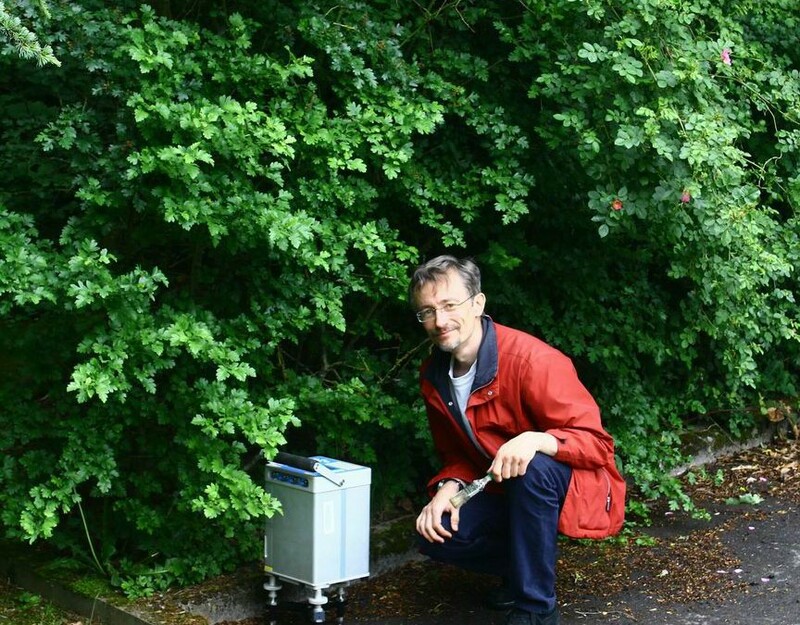 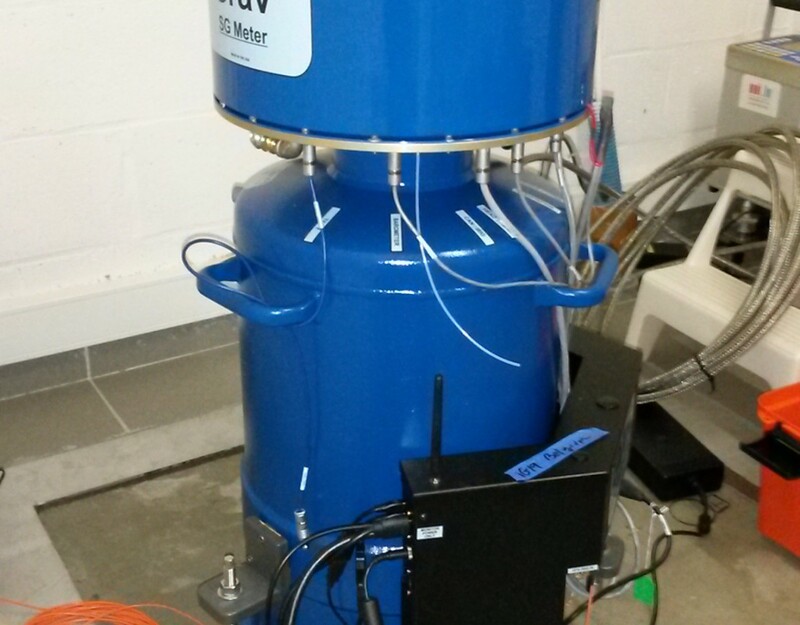 However, a superconducting gravimeter (SG) is able to monitor many more events, with a much better precision of 5 (nm/s²)²/Hz, corresponding to a precision of 0.2 nm/s² (or 0.02 µGal) at a period of 100 s. The sensing unit of an SG consists of a sphere levitating in a magnetic field generated by superconducting coils. 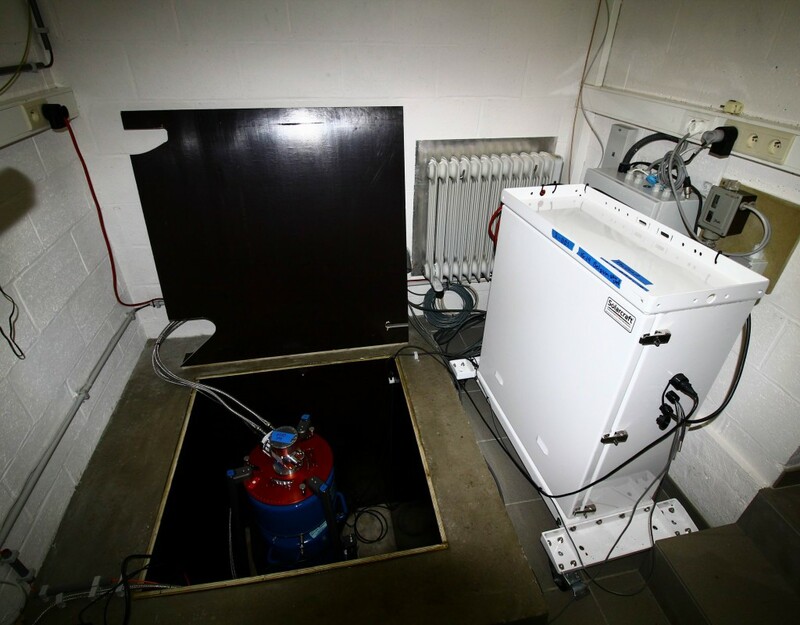 The instrument measures continuously and the noise level is much lower (-20 dB at least) than conventional spring gravimeters. 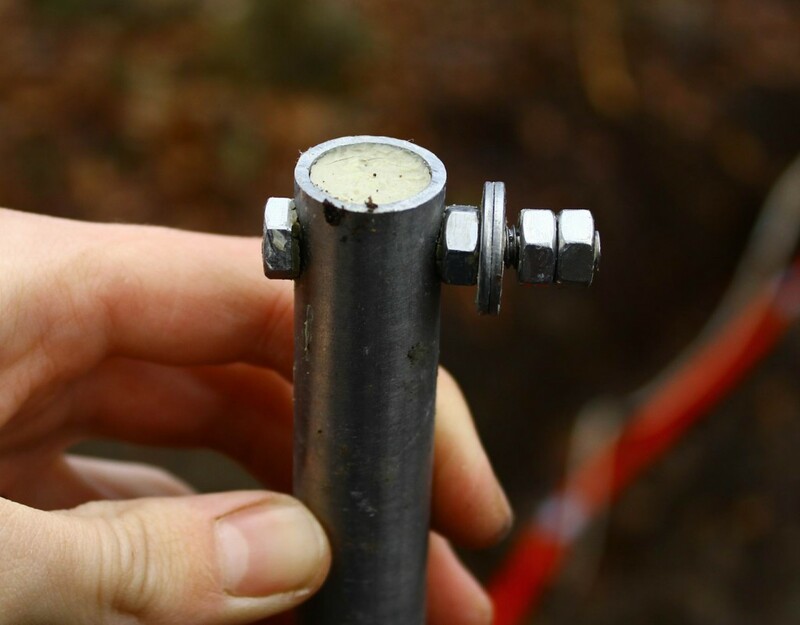 Its very low, regular drift (< 3 µGal/yr) can be estimated using episodic AG observation. 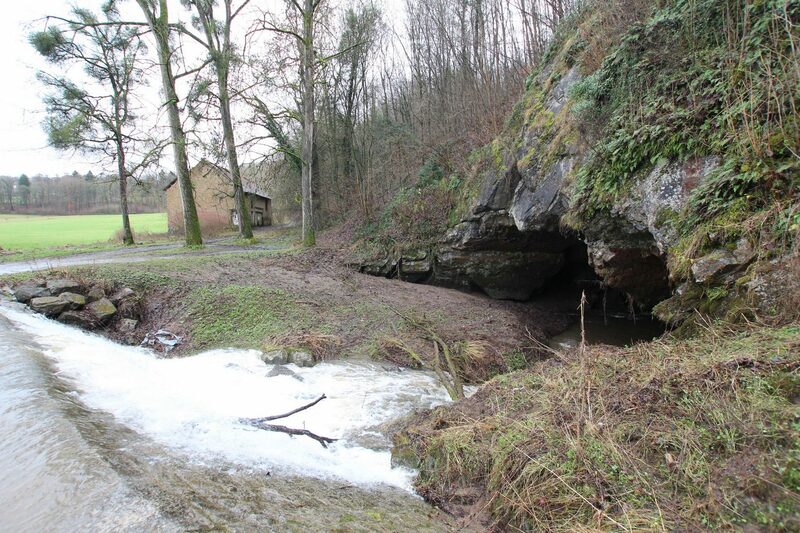 Of particular interest in Rochefort is the canalized Lomme River, which causes flash floods of the cave when the river spills off the dike. 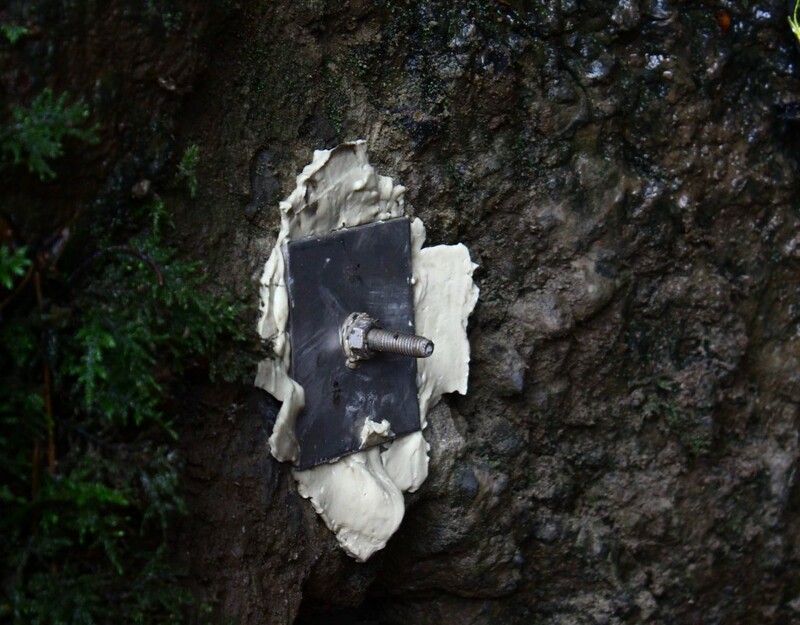 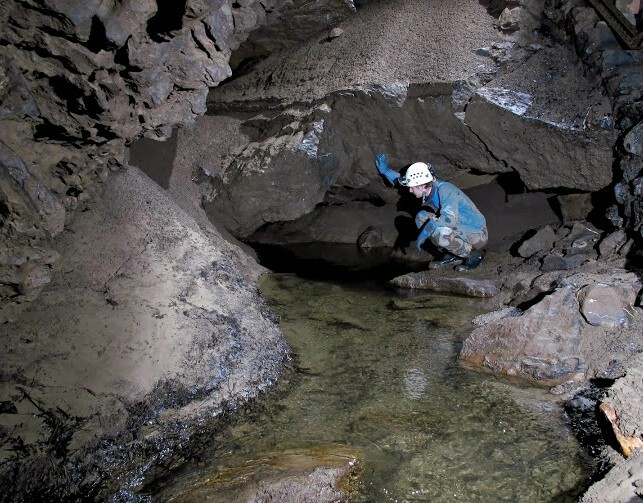 This provides dramatic rises in the hydraulic head, occurring in different conditions of saturation, for example after long lasting rainfalls in winter or after a summer thunderstorm, which can cause floods even when no rainfall is recorded above the cave. 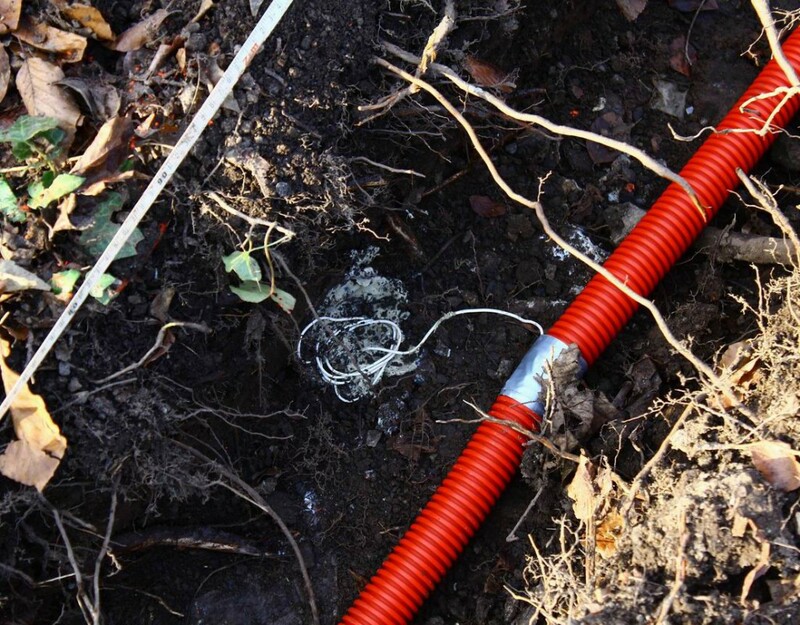 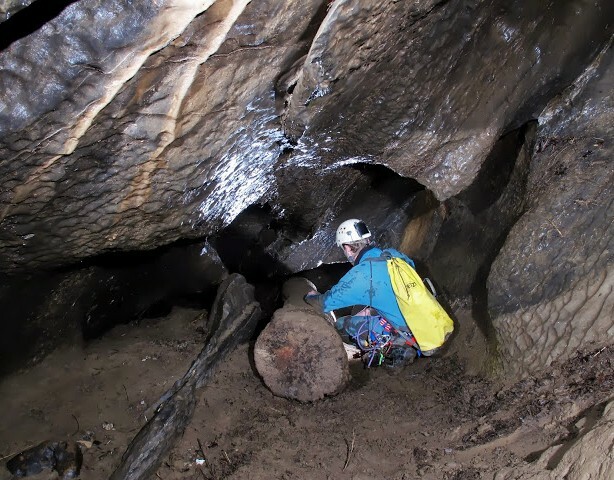 Hence, the continuous gravity measurements will allow investigating the dynamics of the karst, epikarst and infiltration zone as a function of the degree of saturation in the karst at different time scales, from flash floods events to seasonal and interannual scales. 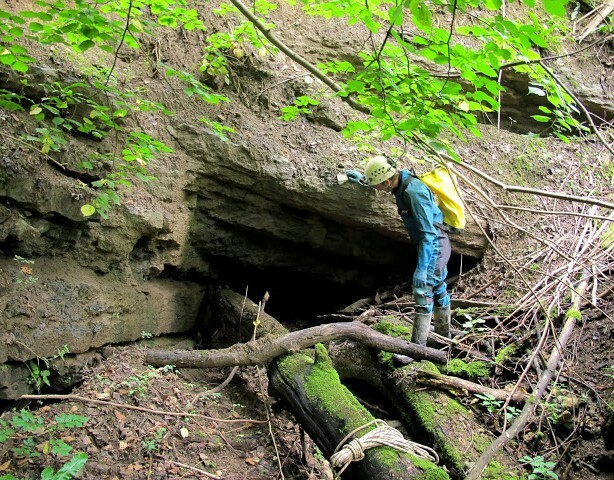 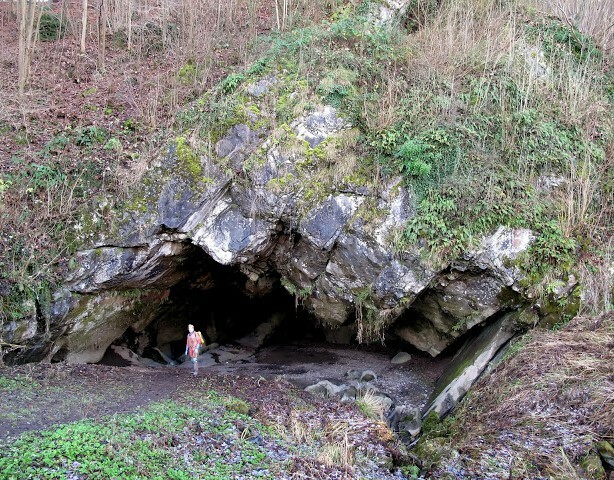 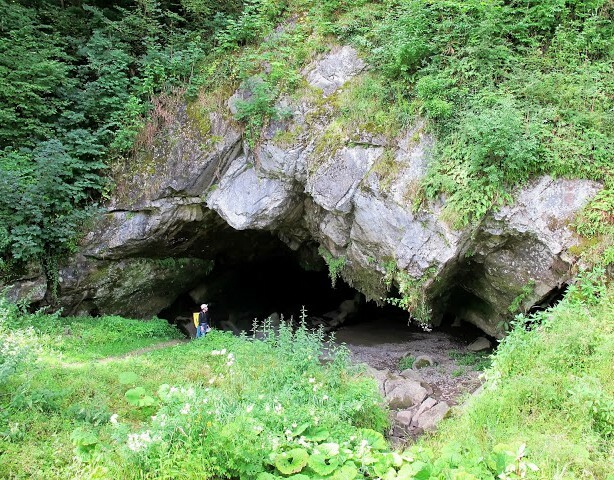 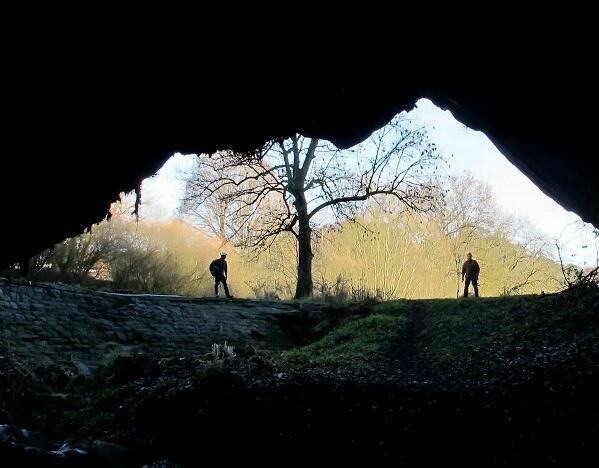 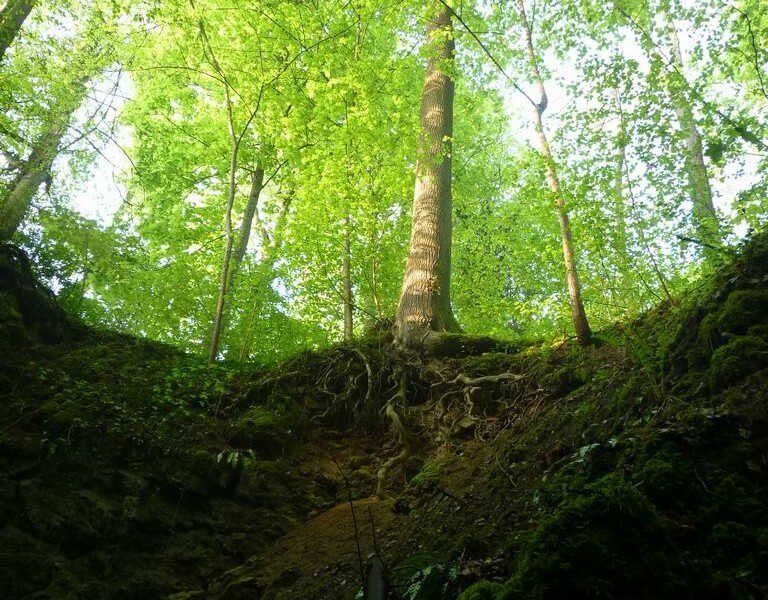 The Rochefort cave is located under the left slope of the Lomme River, near Rochefort, Belgium, and belongs to the karstic meander cutoff network of the Lomme (picture G. Michel (CWEPSS)). 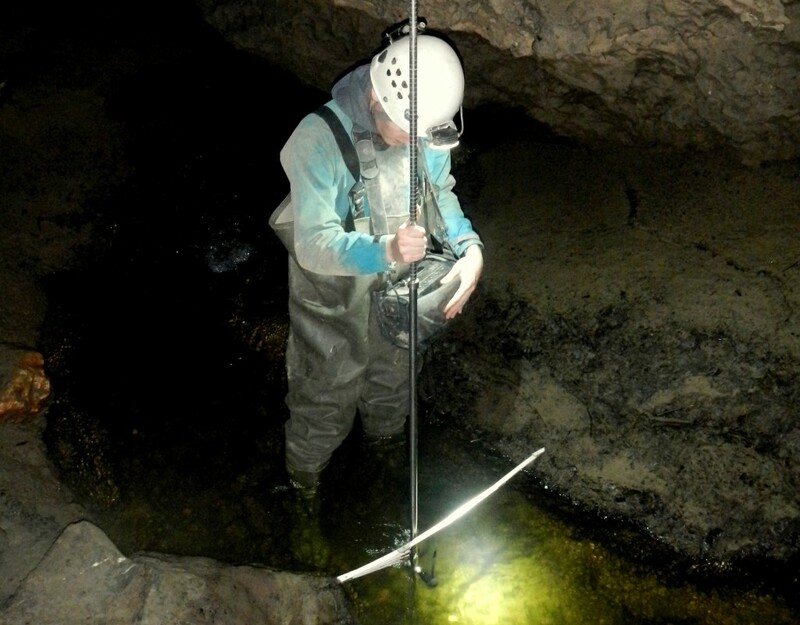 The measurements provide useful insights on the masses of water below the instrument, but cannot uniquely resolve the mass distribution at depth. 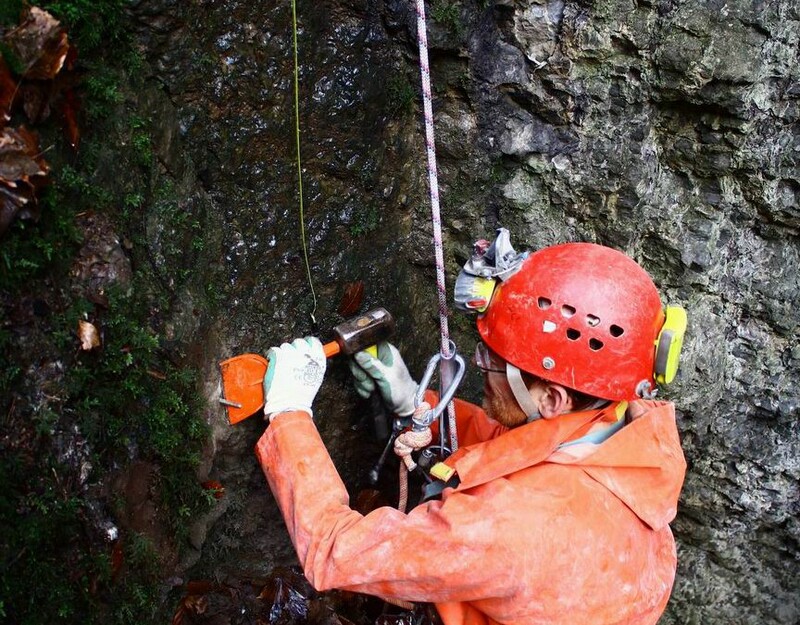 To better determine the vertical distribution of the water storage in the epikarst, we will perform time-lapse gravity measurements in the cave, at about 40 m depth, and at the surface. 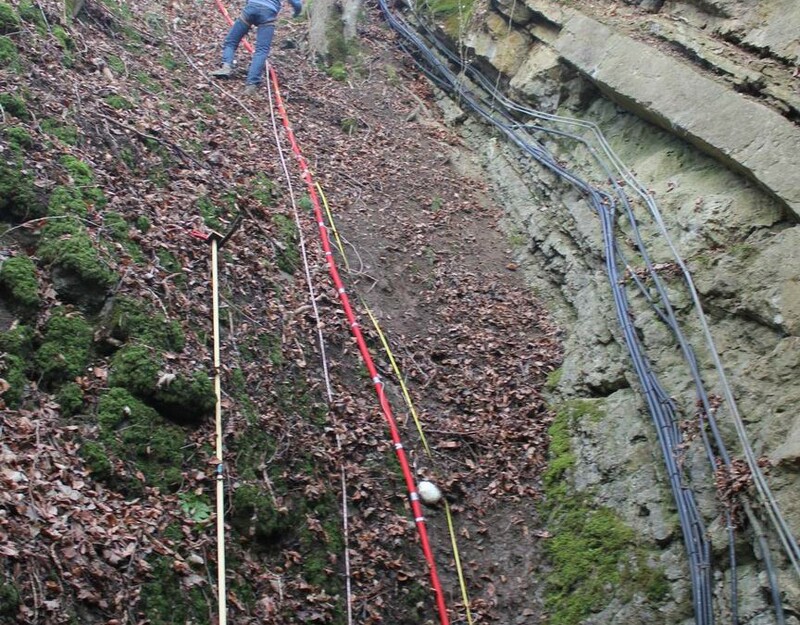 Combining the continuous gravity measurements at the surface and time-lapse microgravimetry with well-logging and the other hydrologic and geophysics measurements will allow separating the water storage changes in the epikarst and infiltration zone above the cave from changes in the epiphreatic and phreatic zone below the cave. 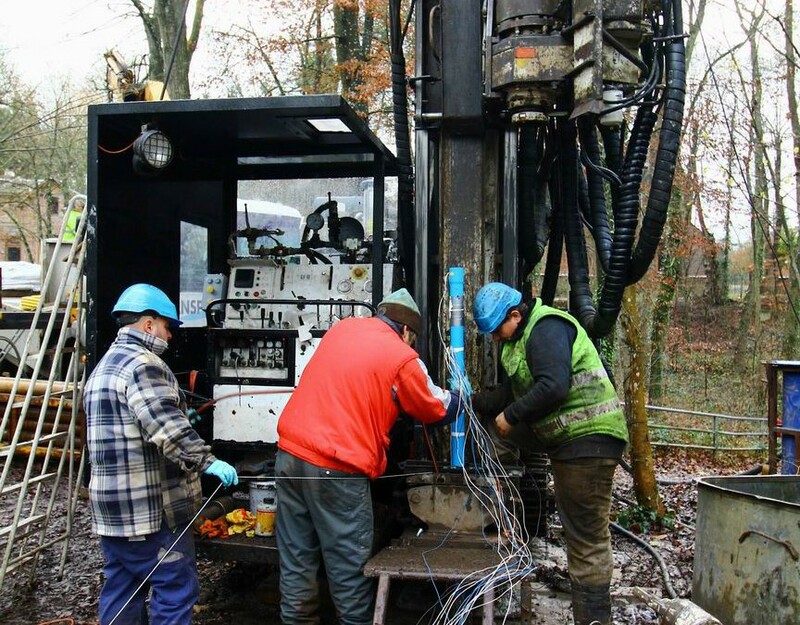 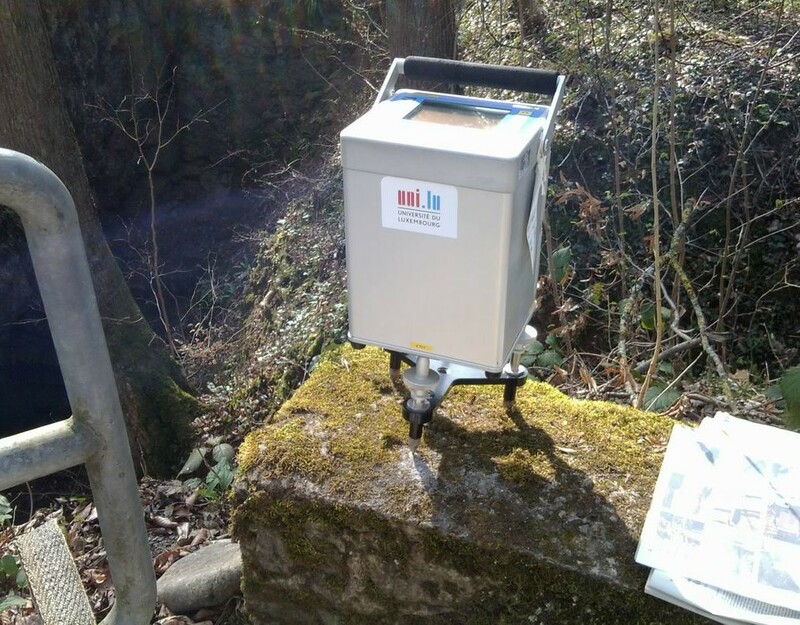 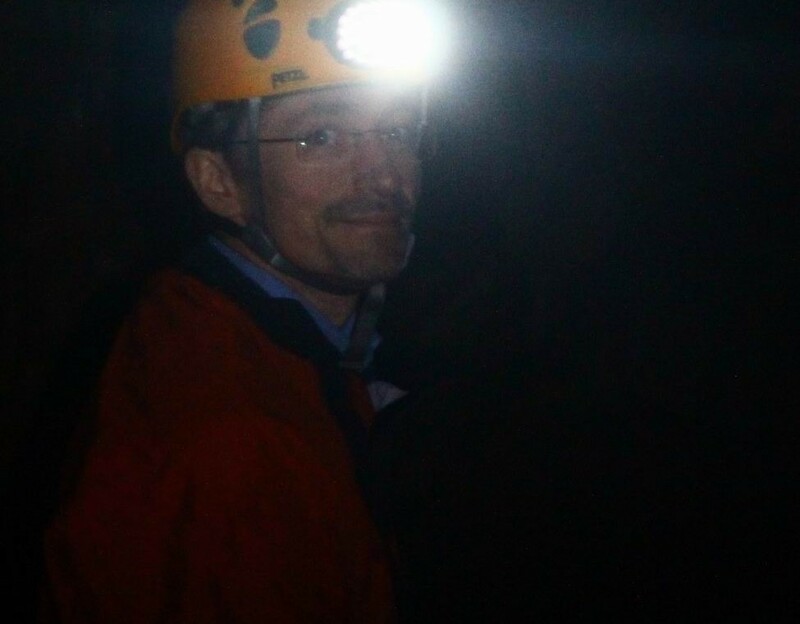 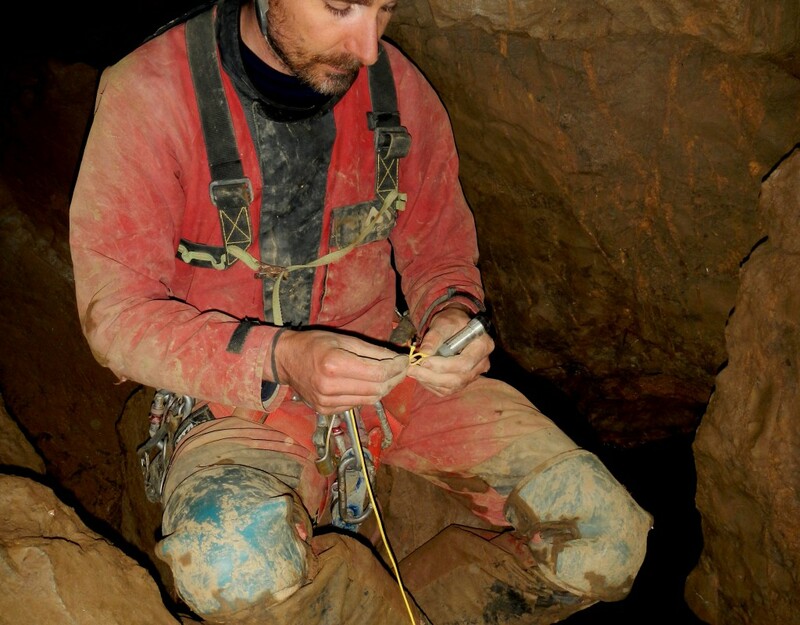 We also plan to perform continuous gravity measurement in the cave using a gPhone, in collaboration with the U. Luxembourg. 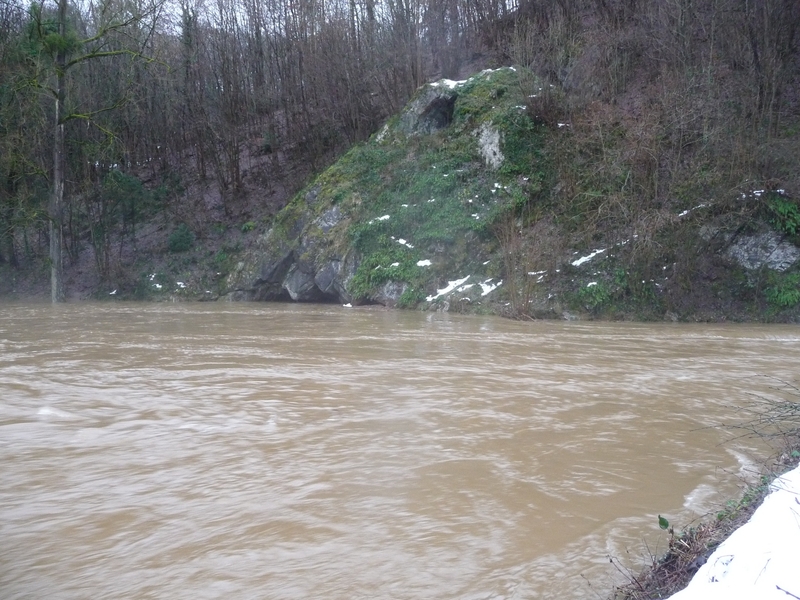 The canalized Lomme River. 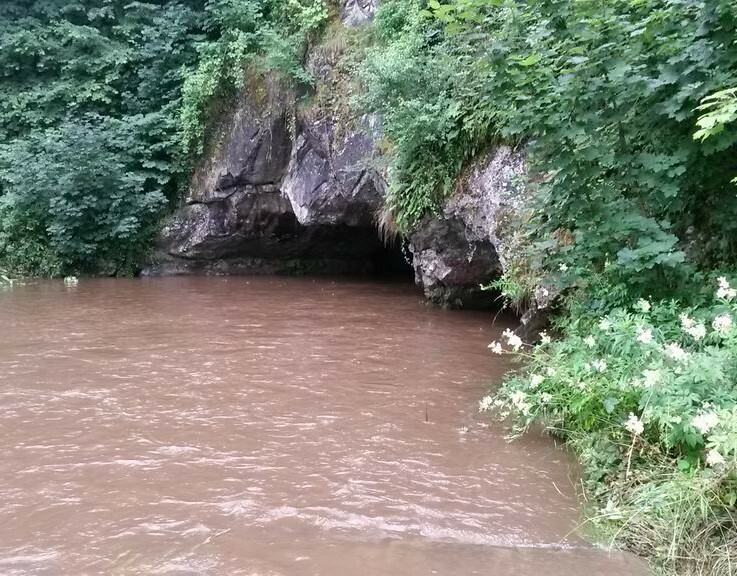 In strong flood conditions, the water spills over the dyke and sinks into the Nou Maulin swallow hole, flooding the cave (2014-07-10). 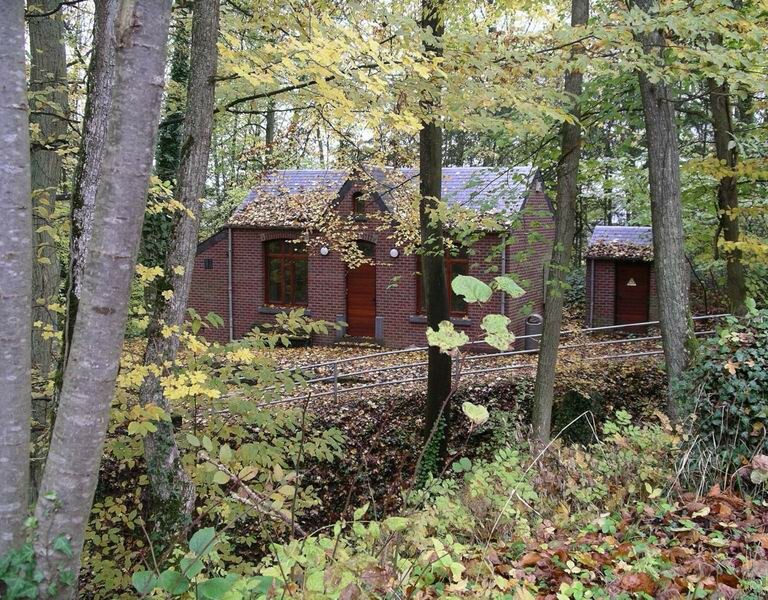 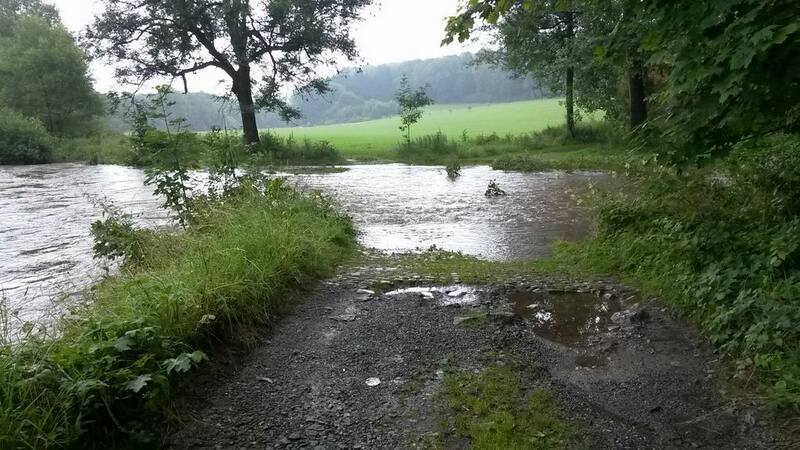 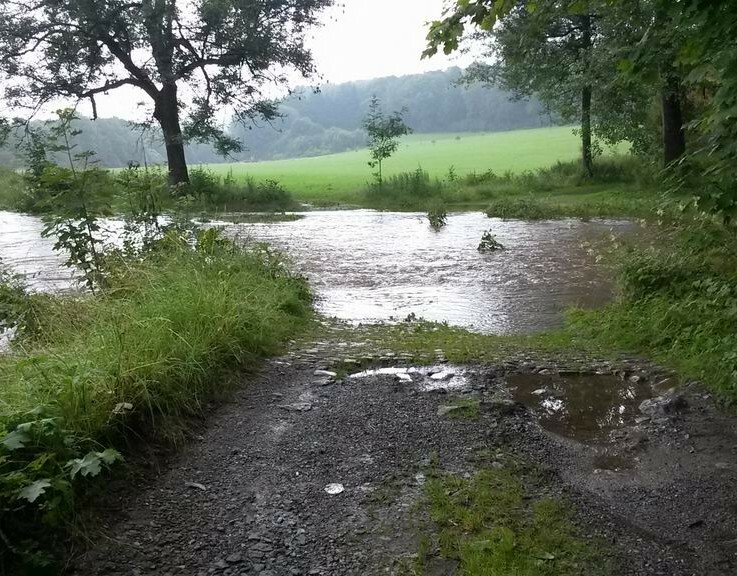 See also here and here where the Nou Maulin is completely flooded (CWEPSS). 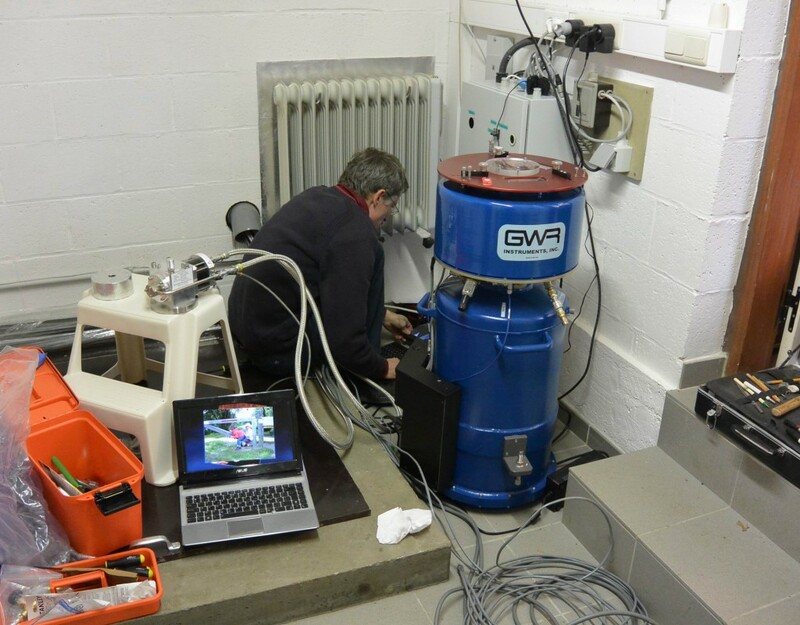 As 90% of the gravity effect derives from within 5 times the vertical separation between the gravimeters, this means that 90% of the signal will come from a cylinder with about 200 m radius at the Rochefort site. 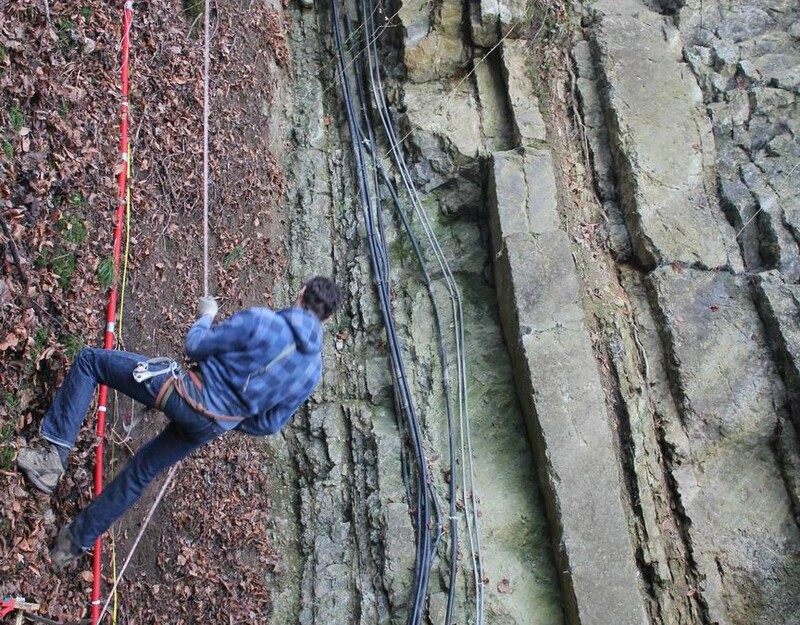 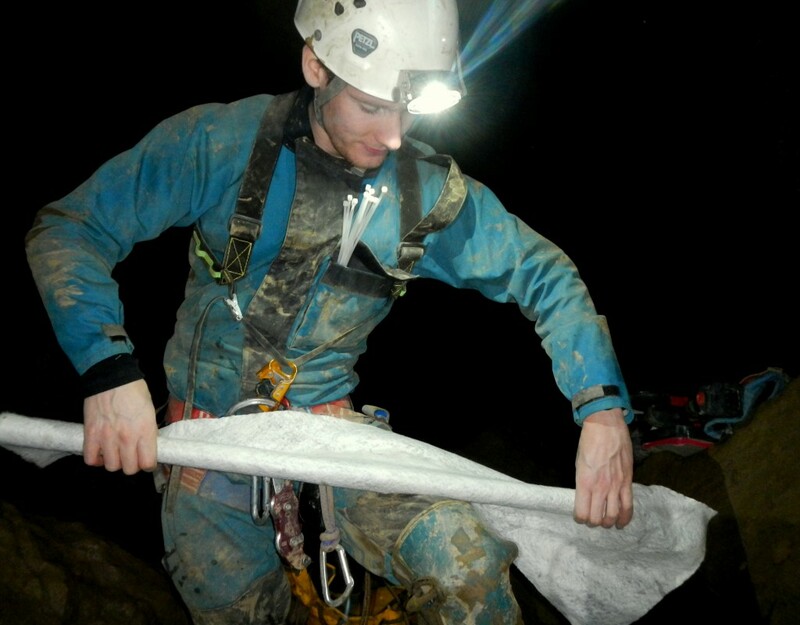 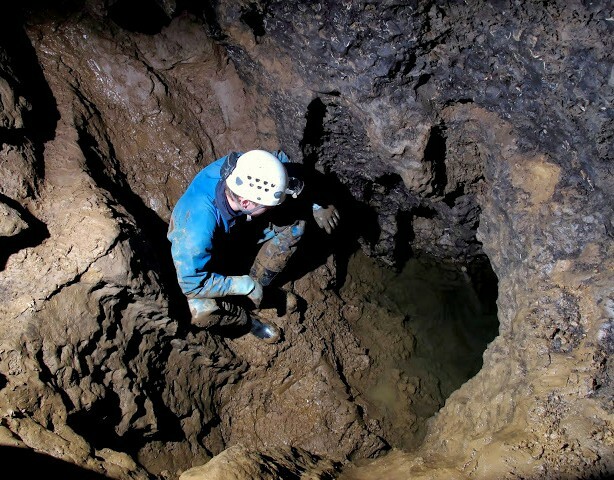 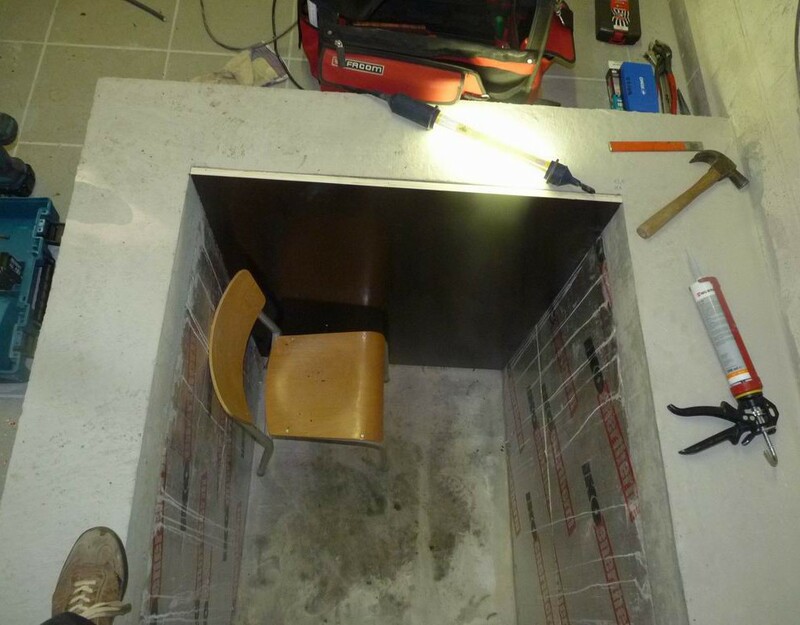 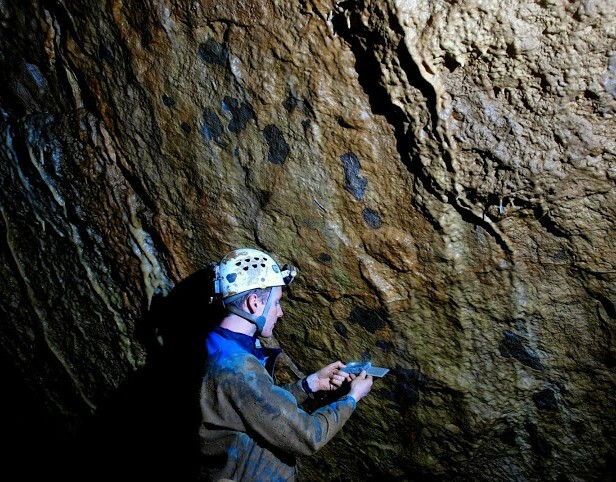 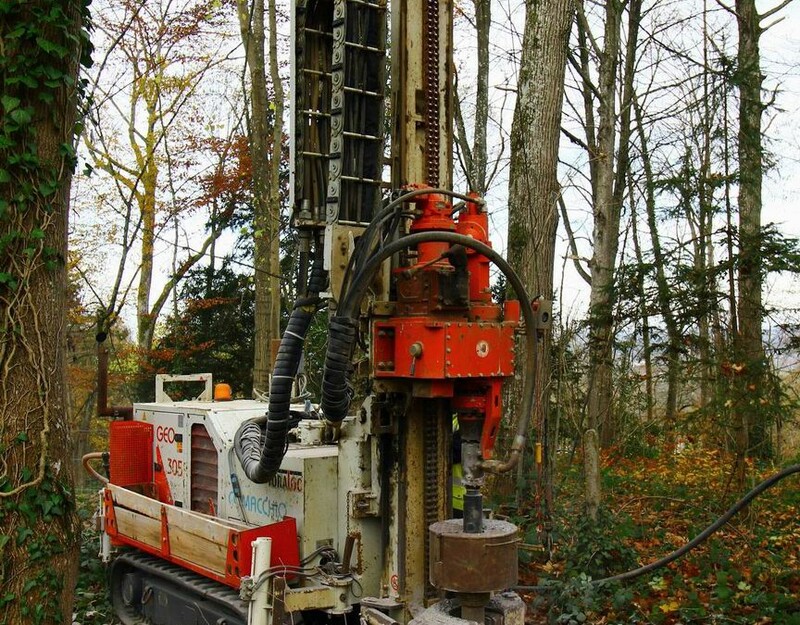 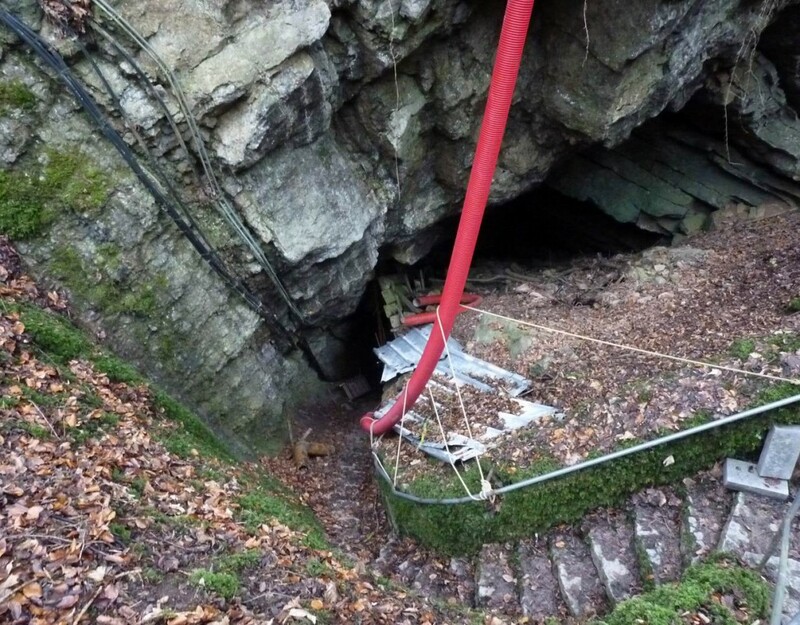 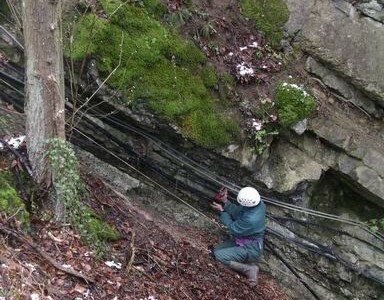 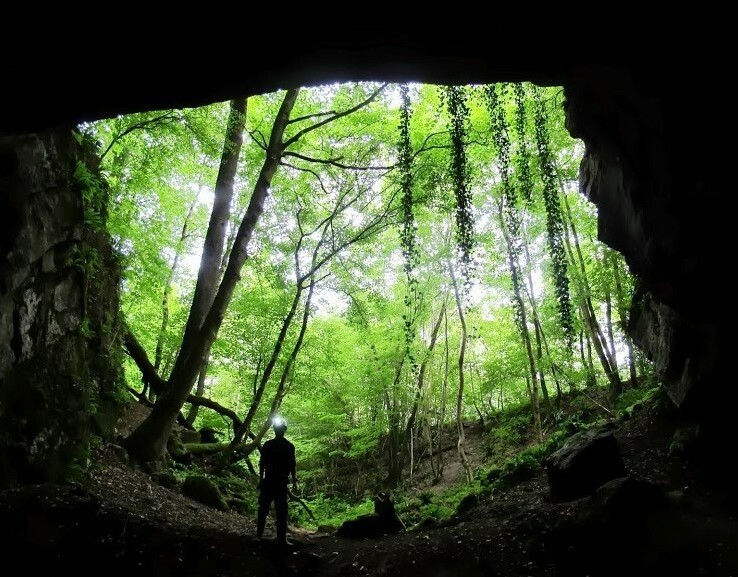 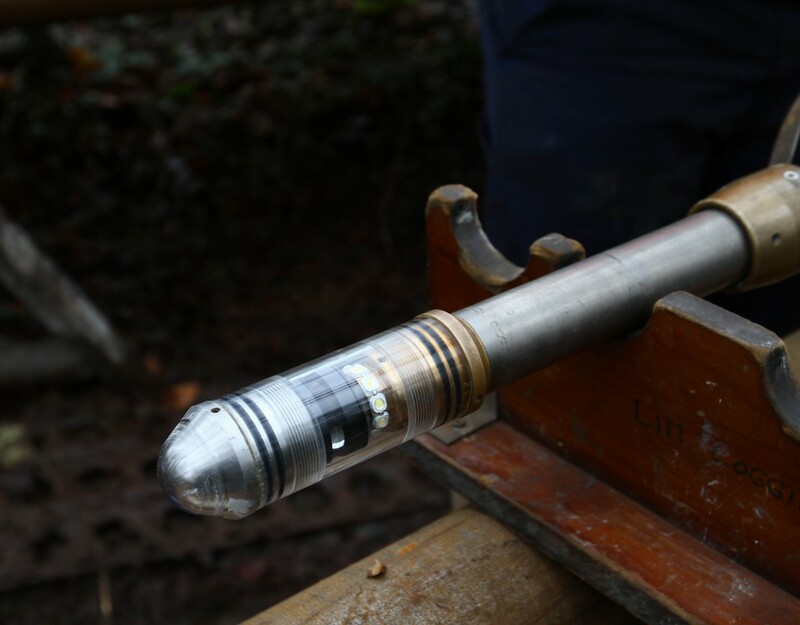 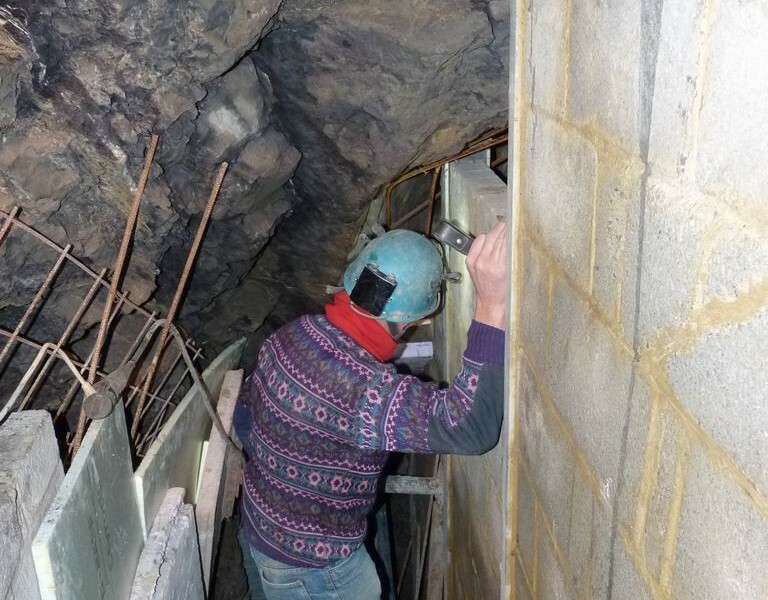 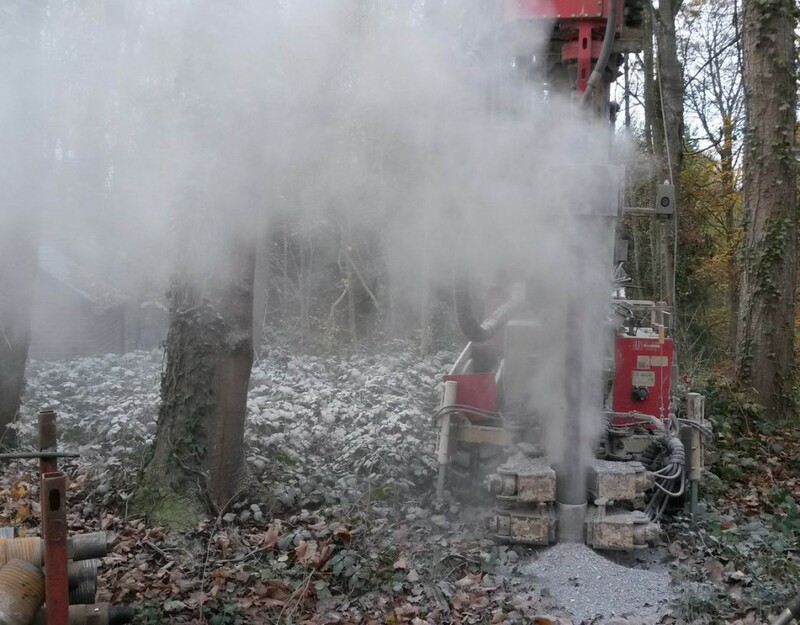 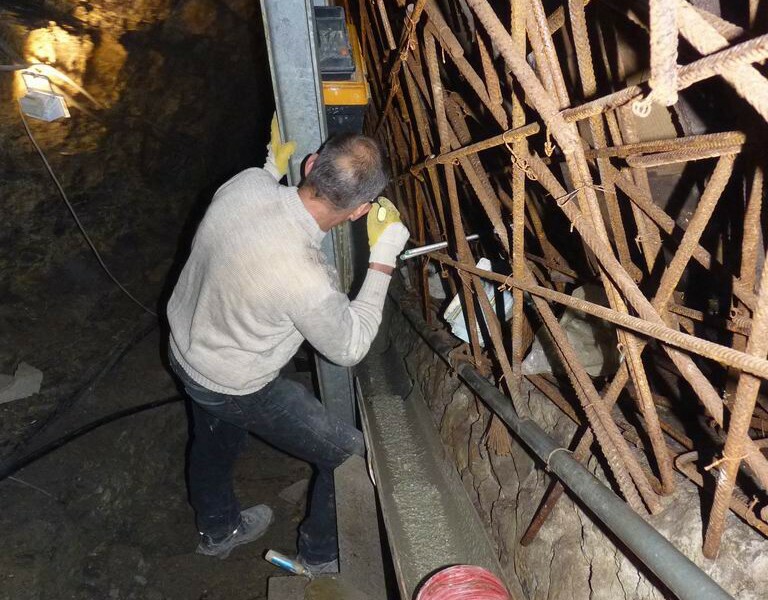 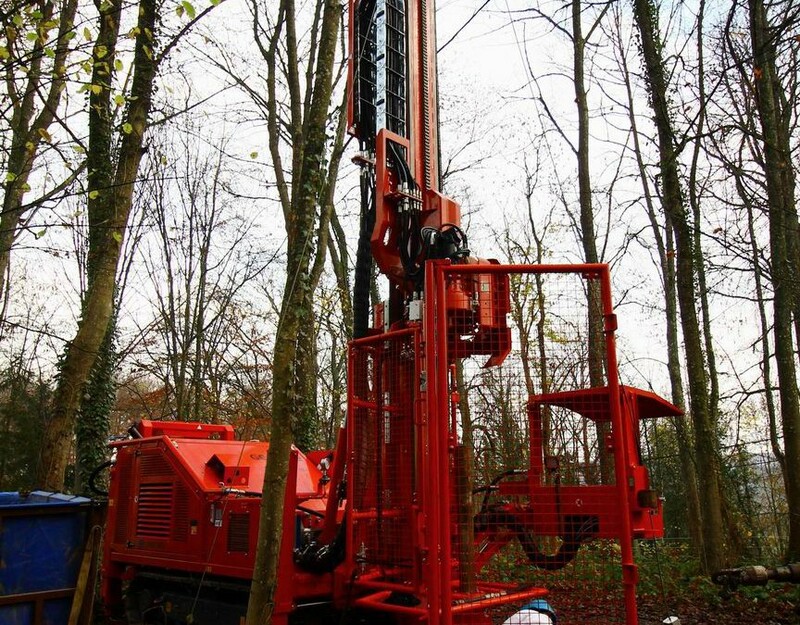 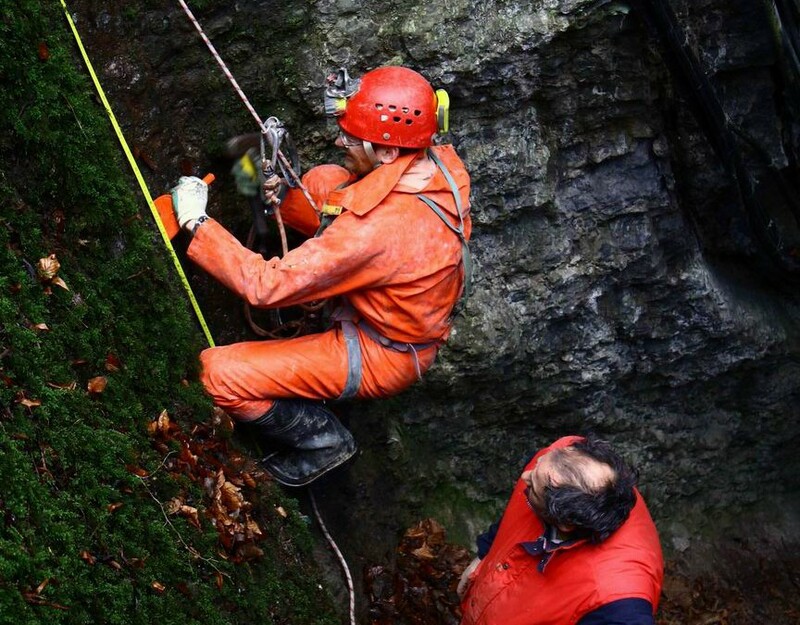 Absolute gravity measurements were performed on the ground surface above the Rochefort cave during 4 winters. 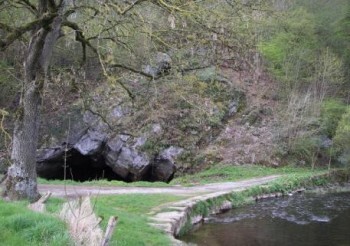 When the Lomme River spilled over its dyke and flooded the cave, this caused dramatic and nearly instantaneous increases in the hydraulic heads in the cave, reaching 13 meters. 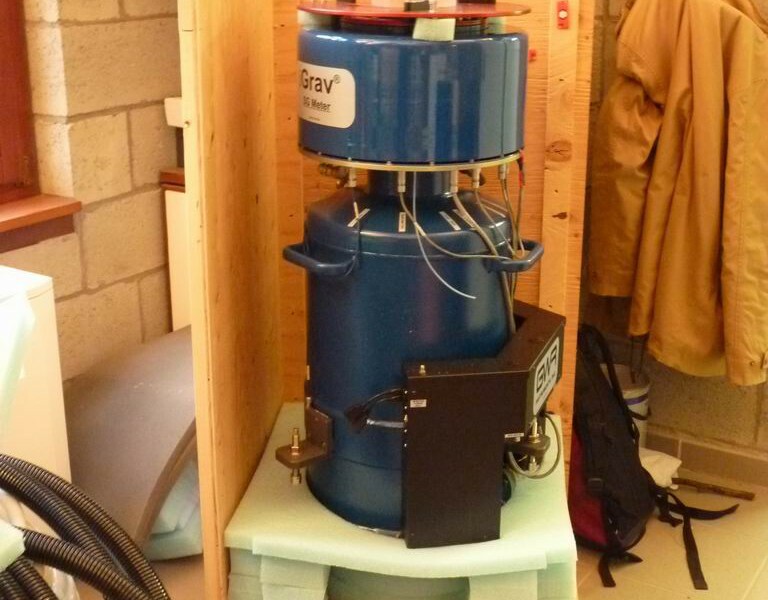 Meanwhile, gravity increased by 12 μGal. 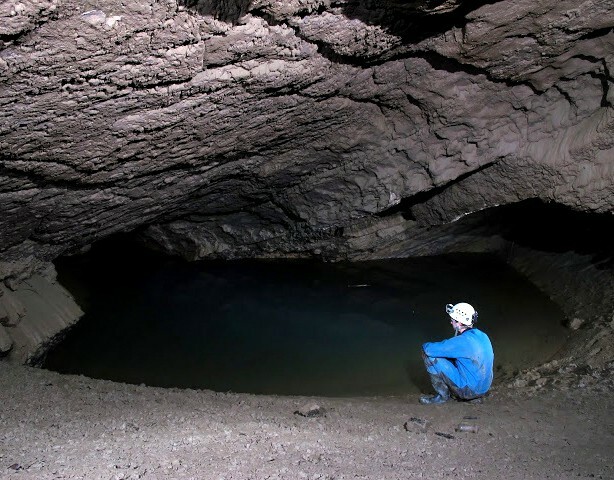 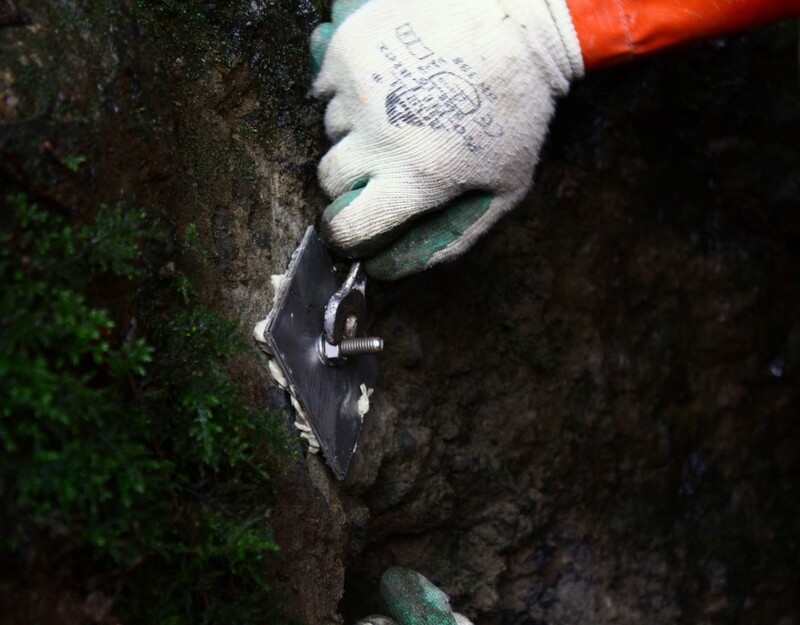 A first conclusion is that during these sudden floods, the pores and fine fissures were poorly connected with the enlarged fractures, cave, and conduits, or that the porosity is lower than expected. 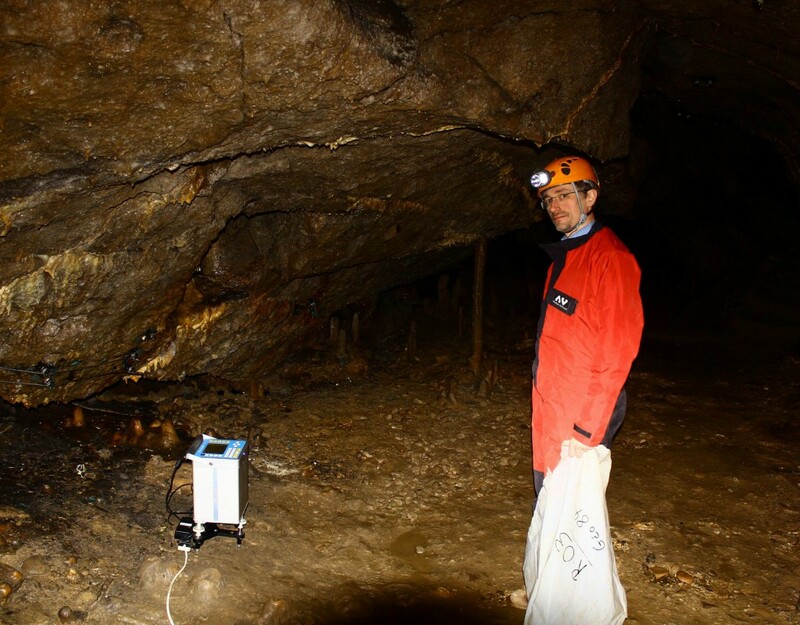 These measurements were not continuous, which did not allow monitoring the response of the karst system as a function of its degree of saturation. 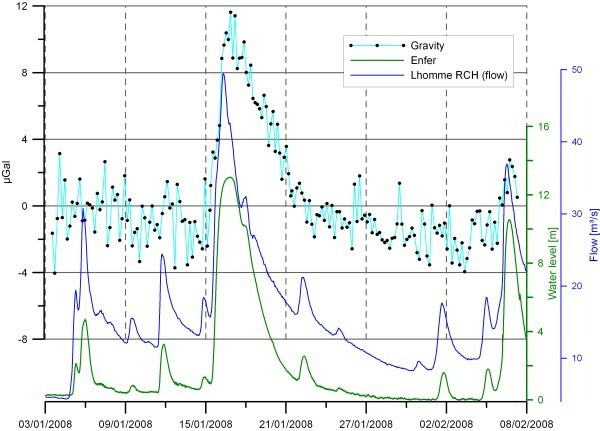 Concurrently, gravity measurements are also performed since June 2006 on the Larzac plateau by the U. Montpellier, revealing water storage changes at seasonal and interannual time scales. 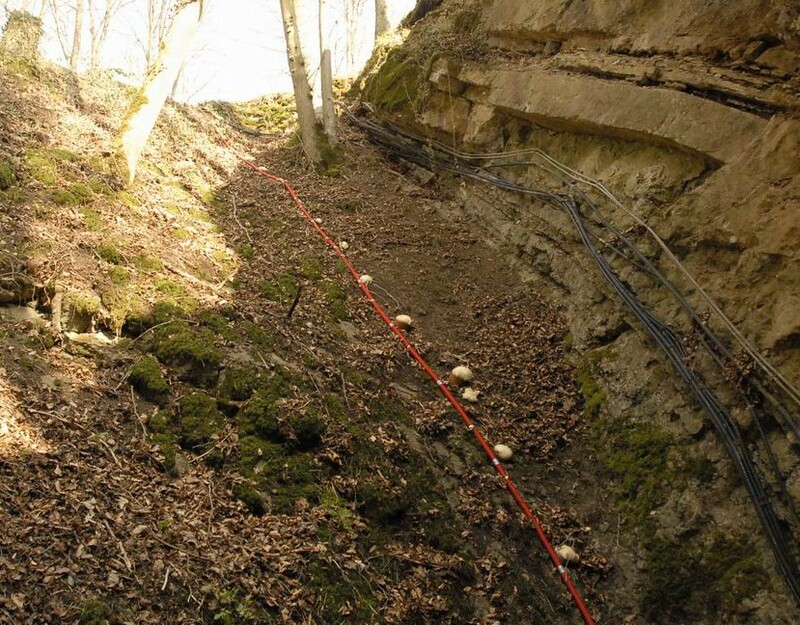 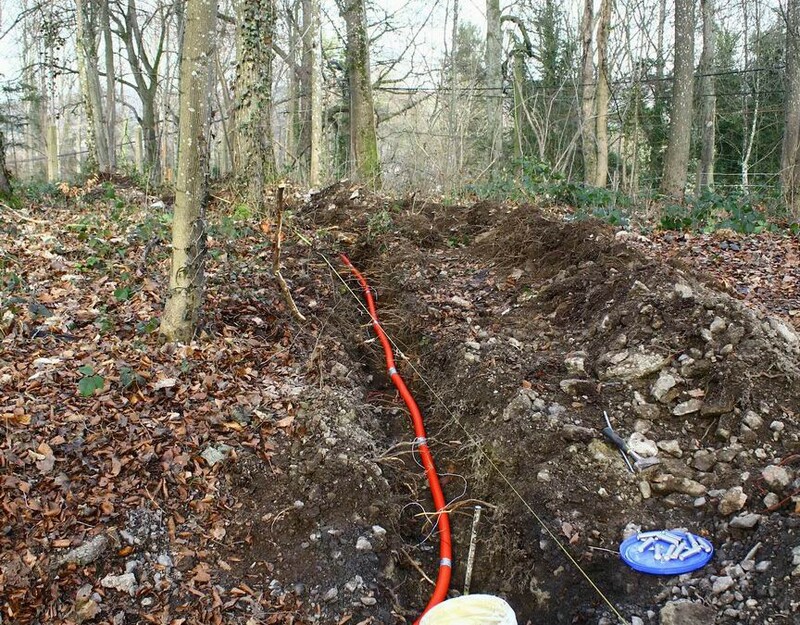 Time-lapse gravity measurement quantified the importance of the epikarst for water storage and the important water storage variations on the Larzac plateau. 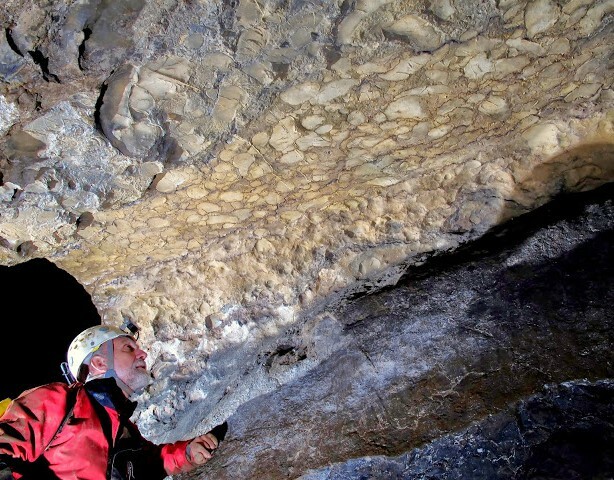 The Larzac and Rochefort systems are quite different: the Larzac system is larger by one order of magnitude and is characterized by a widespread infiltration trough the epikarst, while in Rochefort the water inputs are mainly localized (Nou Maulin swallow hole). 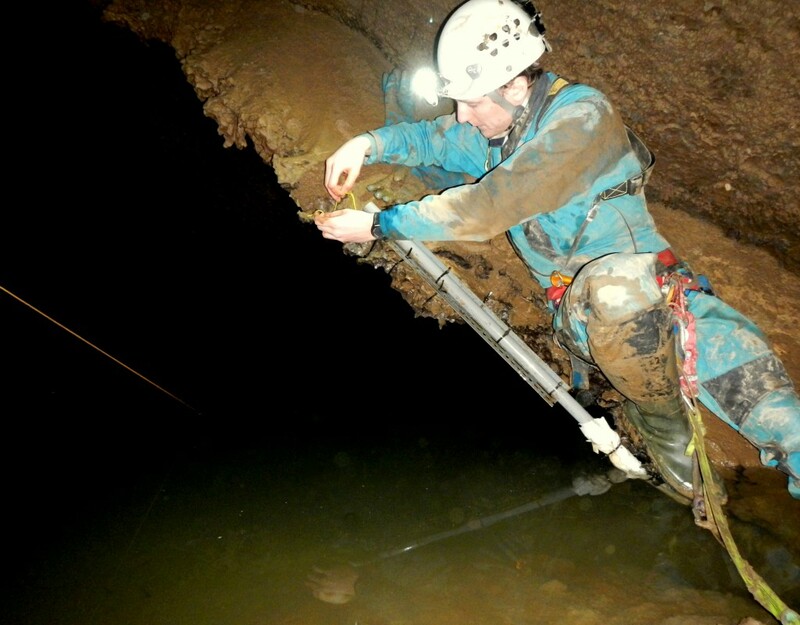 Level of the Lomme River in Rochefort (blue), hydraulic head in the cave (green), and absolute gravity measurements (black dots). 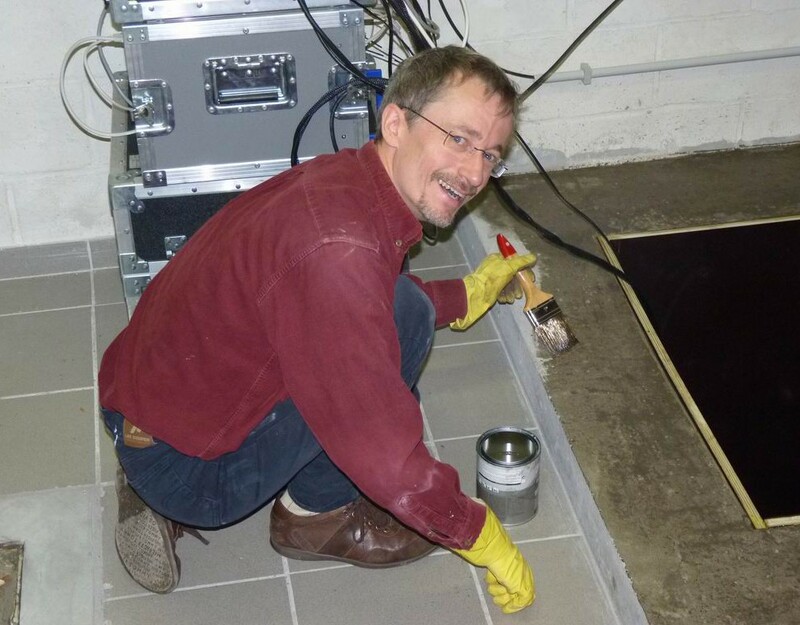 For legibility, the average value of 981 011 438 µGal was removed.